That's right, folks! Kyle & I are going back to Walt Disney World for the Adventures of Kyle & Joanna: Part II! If you follow us on Twitter, you've seen us start up another excited countdown of tweets. If those tweets are any indication of how we feel about the trip, we're both really looking forward to it! I will be creating another epic pre-trip report, but it won't start up for another month or so. (Heaven knows the "where do you want to eat" discussion has lasted about 2 weeks now.) I really just wanted to announce that we're going back, and you'll be able to follow us on our adventure via Twitter (yes, I'll try to UStream some). I plan to have my video camera with me, so you can enjoy our traveling vlog and trip report when we get back too! Top on the list: no more wondering if we'll get along! I embarrassed myself enough by being sick to my stomach almost the entire last trip, so not much worse/more embarrassing can happen (please don't let that be me jinxing this trip)! It's going to be so much cooler & the sun will be much less intense, so no heat exhaustion & sunscreen stops! MVMCP, Osbourne Lights, & Candlelight Processional! Crowds should be really low. 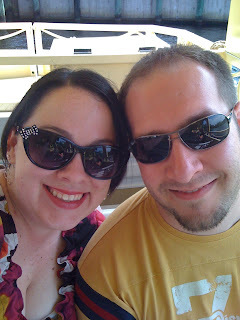 We know each other's preferences & park styles now, so we're going to be better at park hopping and planning our days. Now he really knows I'm not kidding when I say I'm directionally challenged, so he'll automatically just take the lead when we walk into the parks. Anyone else going to be there in December? I'm so excited for you! I'm really hoping to be able to go in December. It's one of my favorite times to go. And I've never been to a MVMCP before so I'm hoping to do that, too. I can't wait to read more of your trip report! Thanks! :) This will be my first MVMCP too! When I was there Thanksgiving 2010 I missed seeing the Osbourne Lights (even though they were up and running), so when Kyle mentioned them this time, I was stoked!